Recycling is the buzzword today in the context of environmental protection. Recycling is essential as it helps the re-use of sustainable materials in all walks of life and reduces the load of harmful materials mixing with the earth that damages the environment. Even the simple looking candy wrappers can be greatly damaging if not recycled. All those individually wrapped treats might be great to taste, but the wrappers can take up a lot of space in the landfill. Moreover, all kinds of wrapper materials might not be suitable for sending to landfill as it can pollute the environment. 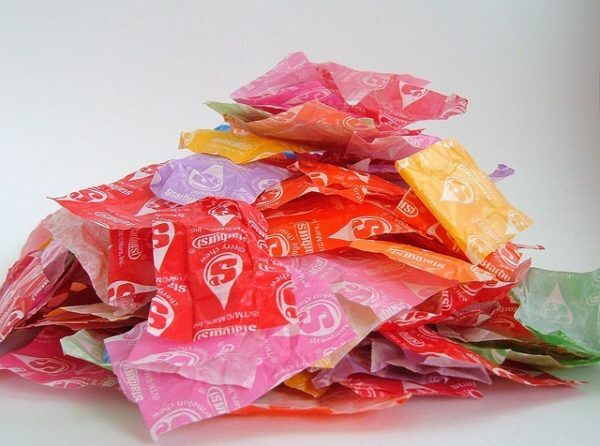 Therefore, a more sensible way of dealing with discarded wrappers of candy is to think about ways of recycling it. In this article, we will discuss the available opportunities of recycling wrappers so that you can do your bit for Mother Earth to save it from further destruction. Enough damage has happened already, but it is never too late to take some positive actions to relieve the earth from the spoils that we mindlessly dump on it in the name of a landfill. Let us now look at the options available for recycling wrappers. The problem with wrappers used for candy is the type of material which is composite in nature being an amalgam of foil and plastic. Since it is not possible to separate the elements of wrappers easily, the chances of recycling it seem quite bleak. However, things are changing as evident from the latest practices in some regions in Canada. For example, the residents of British Columbia can now throw wrappers in recycling bins or bags that the local bodies collect and send for recycling. The target of the local bodies is to collect all types of packaging and send them for recycling. Check with the authorities in your area if such a facility exists so that you can make use of it. If you are not lucky enough to live at a place that offers free recycling opportunities like the one mentioned above, you can still discharge your responsibility in protecting the environment by taking up some paid schemes for recycling wrappers and packaging. A company in the US, Teracycle has come up with a scheme of selling cardboard boxes to people for filling with used wrappers and then sending back to the company that arranges for recycling it. The cardboard box costs between $86 and $231 according to the size. The company uses special equipment to separate the materials in wrappers and then recover the plastic component and selling them in the form of pellets for re-use. The plastic is suitable for industrial use like fabricating park benches and playground equipment. With opportunities for recycling likely to increase, the onus of recycling wrappers largely depends on the attitude and willingness of users who must come forward to drive the initiative further. The sweet candy will taste sweeter when you realize its potential in helping you to do something good for the environment which is the need of the hour.